At the age of four, if you would have asked anyone in my family what they thought I would be when I grew up, without a doubt they would have replied with a resounding HAIR STYLIST! Why? Well because by the age of four, I was blow-drying, curling, spraying, teasing (yes, teasing- it was the 80’s…who am I kidding? I still tease my hair) and braiding my waist-long blonde hair. I was incredibly particular about my hair too. My pony tails couldn’t have any bumps or whispies sticking out, and my braids had to be tight. I wanted to be perfectly coiffed all the time! By the time I hit junior high, I was doing all my friend’s “up-does” for dances and special occasions. By high school I was cutting my friend’s hair, and by college I was coloring my roommate’s hair — tin foil and all! I always imagined that one day, when I had a daughter of my own, she would love to have her hair curled and braided just as I did when I was young. Well, I got my sweet little girl, and for as beautiful as she was, she was born totally bald. Think of a cue ball and then picture a cute little face on it — that was my daughter. It took about two years to get enough to even pull the tiniest bit back into a little barrette. Now my daughter is three years old and she has a bit more hair- just enough to get really snarly and turn a perfectly delightful morning into a morning filled with weeping and gnashing of teeth. The girl HATES to have her hair combed and she has an incredibly sensitive head. I can’t really relate (and thus am probably a little bit less understanding than I could be because I never had sensitivity issues). I had a head of steel! I don’t really understand how it could hurt that much to justify so much drama. I don’t even have to touch her head with the comb before she starts in on the drama. As soon as I even say “It’s time to comb your hair!” the antics begin. I had to do something about this snarly situation before I gouged my eyes out in frustration. The answer? Detangling spray of course. But since I’m a #LiveFromScratch kind of gal, any store bought chemical-filled brand would not do. 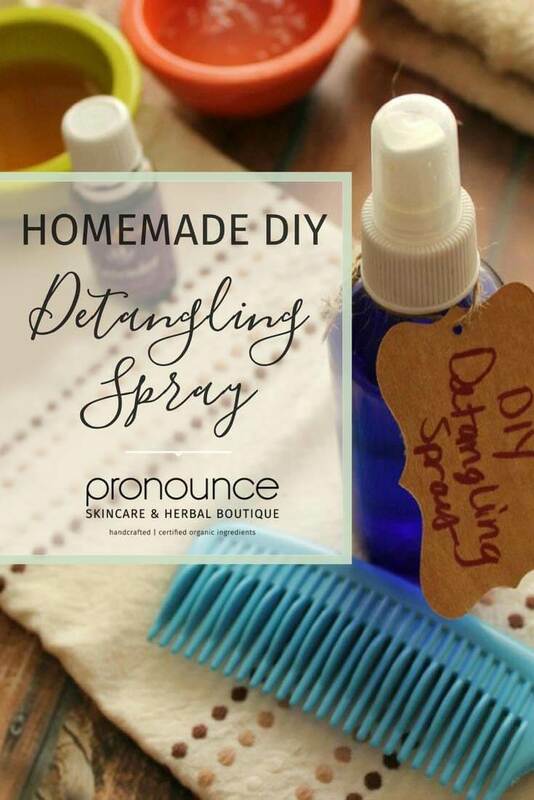 Thus began the quest to come up with my own simple, yet effective, from scratch DIY Detangling Spray. If you pick up any commercial detangling spray off of the store shelf, you’ll find a bevy of hazardous toxins ranging from parabens to fragrances. One particular brand I picked up had some especially malignant ingredients, even some that I’ve never heard of. A chemical called DMDM Hydantoin was one such ingredient. According to the Environmental Working Group, DMDM Hydantoin is a formaldehyde releaser, and is concerning for cancer, allergies/immunotoxicity, formaldehyde contamination, and skin, eye and lung irritation (source). Okay, I don’t know about you, but I just can’t see myself spraying that stuff on my kid’s head! And here’s the rub: once you’ve read this information — once you are made painfully aware of the dangers of this product and many others similar to it — you can’t un-know it! Now that I’m aware of what’s in this seemingly benign product, I simply cannot in good conscience expose my child to it. So what’s a girl to do? Go straight DIY with it of course. Since I’ve found in the past that making my own non-toxic personal care and cleaning products is really much simpler than one would think (heck, I’ve already been making my own lip balm, orange vanilla whipped body butter, Stretch Mark Salve, and Febreze Spray, to name a few), why not figure out a way to concoct my own DIY detangling spray? Many recipes I found called for a bit of store-bought hair conditioner and water. That’s it! I’m sure that’s quite effective. However, my daughter has very fine hair, and I was concerned that the conditioner would leave her hair with a greasy look and feel. Not exactly the look I’m going for. 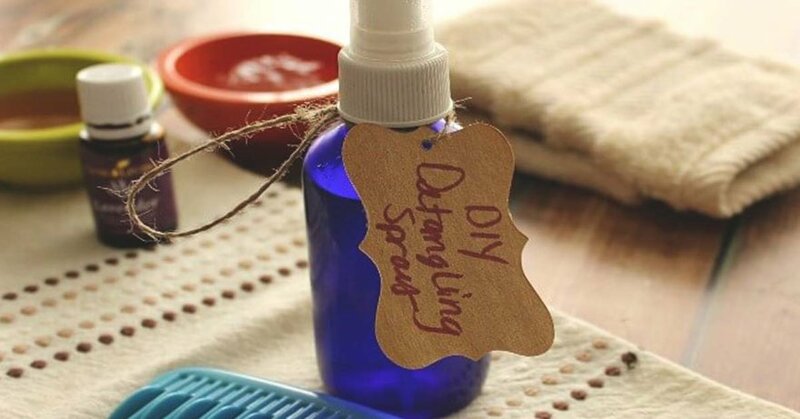 Since I’ve used apple cider vinegar in my hair as a toner/conditioner before, I thought that would be a great place to start with this DIY detangling spray. Apple cider vinegar is not only a natural conditioner, but it also helps balance the pH of the hair, and remove product build-up. 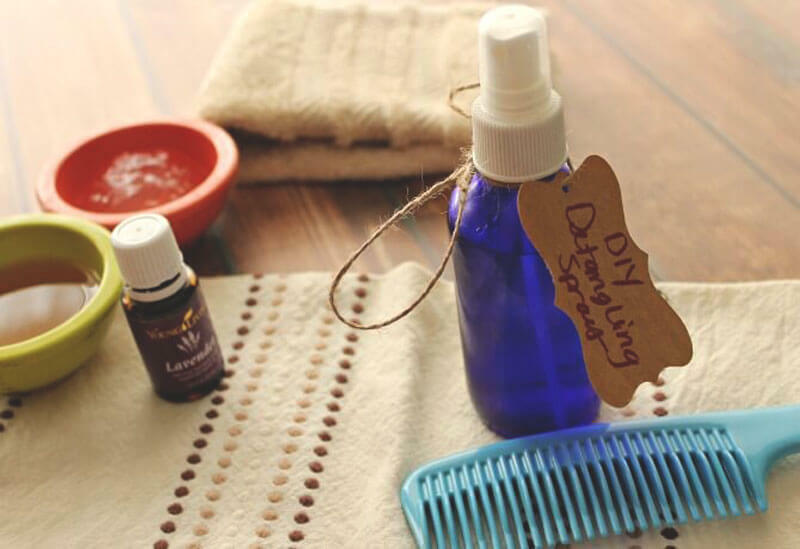 The next ingredient in this great DIY detangling spray is aloe vera gel. Aloe vera contains 20 different amino acids, which condition and help promote natural moisture in the hair. Those are really the only two ingredients you need but I didn’t want to stop there and I took it to the next level — I added a couple of essential oils! These are a completely optional add-in, but they definitely give this recipe a boost. Initially I just added lavender for scent (since I didn’t want her to smell like apple cider vinegar), but as I did more research I discovered that lavender can stimulate the sebaceous (oil) glands to produce oil — so it’s perfect for my little one’s dry hair. I also added a few drops of cedarwood oil as it stimulates hair growth. Pour all of the ingredients in the glass bottle and give it a good shake to make sure that the aloe vera is well distributed. You can apply this to wet or dry hair — spray liberally and comb through. If adding the essential oils, it’s particularly important to make this recipe in a glass bottle. It’s always prudent to avoid plastic when possible, but especially when using essential oils. The plastic will leach chemicals into the spray and then you’ll be spraying phthalates on your head and you’ll completely defeat the purpose of making your own detangling spray! 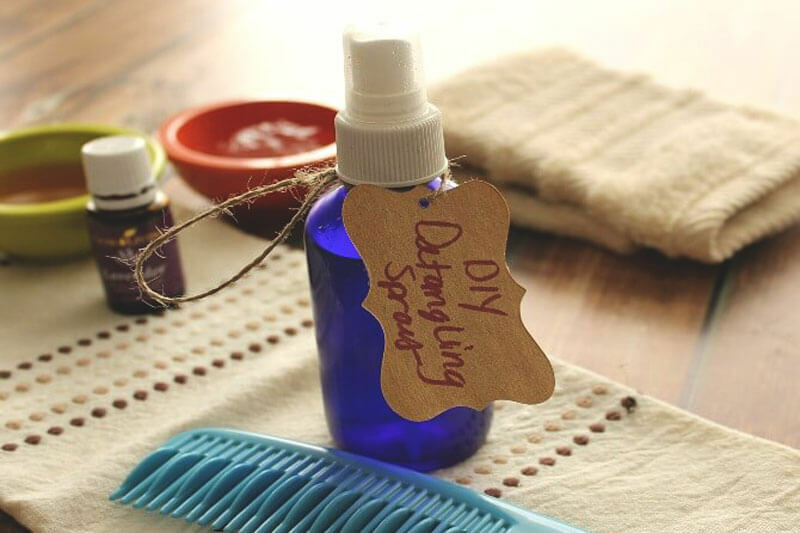 I’m so happy to tell you that this DIY detangling spray has greatly reduced the drama surrounding our morning get-ready routine… well, at least for the hair. I hope this recipe helps smooth out your morning routine too! p.s. If you’re dealing with dry, brittle hair you’ll definitely want to try our nourishing DIY hair oil! Please, head on over to my Pronounce Skincare Shop where I sell some of the ingredients needed to make this recipe. While you are there, please look around at all of my other skincare creations. I love making them for my family and for you! Hi there. Just found your blog today and love it! Just wondering if this works as a “defrizzer” as well. Thanks!! Hi Christina! Yes, yes…it’s a great detangler and ‘defrizzer’! I also have this recipe for frizz. Another great option is my handcrafted Hair Serum.